I was disappointed to read a recent article (and see video) of a brawl between parents and students at a high school basketball game. Yes, you read this correctly … brawl > parents > students > high school > game. This should never happen. We are living in a civilized country with common ideals. Where is the parental leadership? My leadership tip for you this week is to commit this year to maintaining control of yourself. 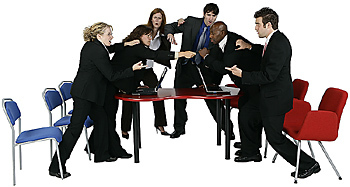 Avoid conflict at work and in your life. Work towards understanding, cooperation and collaboration. When you think about it, there are many instances throughout the course of day, week, month and year where we are faced with potential conflict. It’s easy to enter into conflict. It’s just as easy to avoid conflict. Directly from our Ultimate Supervisors Training course, here are a few suggestions of how you can avoid future conflict. Be respectful at all times, regardless of the circumstances. Speak to people like you like to be spoken to. Treat people like you like to be treated. Don’t tolerate others disrespecting others. Have a positive outlook on any situation. Put a positive spin on negative issues. I think it is healthy to have differing points of view with vigorous debate. As long as it doesn’t escalate into long lasting conflict. As leaders, much is expected of us. Central to all expectations is our ability to remain mentally tough, so as to maintain control of ourselves at all times.